What is Wild Blue Boutique's Return Policy? 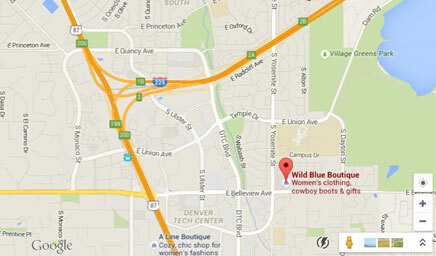 Wild Blue Boutique appreciates all of our customers patronage and respects your privacy. Under no circumstances will we distribute, sell, loan, or rent any personally identifiable information, regarding its customers to any third party. All personal information collected during any purchase is strictly used for tracking and corresponding order information with our customers. Cookies are used to keep track of your shopping cart. Your happiness is important to us and we hope that you will love your purchase, however, we know that sometimes things don’t work out. If this is the case, feel free to send it back within 14 days for a store credit or exchange. Your store credit has no expiration date and becomes part of your payment history and will be automatically applied to your next purchase. A copy will be emailed to you. What is an acceptable return? All items must be returned unworn with original tags attached and in the same condition as you received it. Shoes or boots must be returned n their original boxes. Jewelry and scarves cannot be returned. Clearance items are final sales. How do I issue a return? Please package your return items along with your packing slip and mail to the address below. If you would like to exchange an item calling or emailing us as soon as possible would be great so we can hold the item for you. Once your package is received, please allow 2-5 business days for processing. You will receive an email confirmation regarding this after we receive the item.